Anyone who has ever driven off with the baby seat left on top of the car roof (and who has not?) knows that you cannot always think of everything. This principle also held true back in the days of the founding fathers. That is why they left the Constitution and Bill of Rights open to further amendment. The need for the new nation to be able to respond to unpredictable circumstances was demonstrated by the wartime Articles of Confederation of 1777, which were found insufficient for peacetime government. 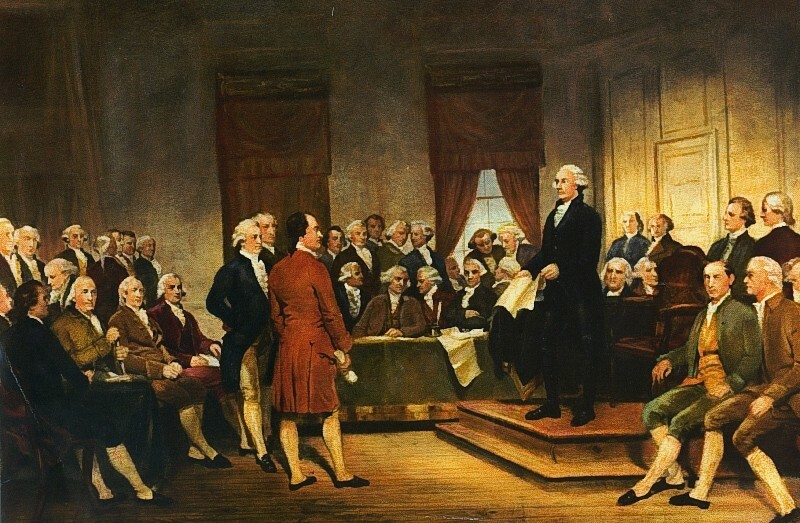 In1787, the Philadelphia Convention was convened to bring the Articles up to date, but that task was so daunting that the Convention decided to create a new constitution altogether. Great minds gathered, but they still could not think of everything. Even the staunchest libertarians usually agree that the defense of the nation is an acceptable function of government, so you would think that establishing an army would be a no-brainer for our founding fathers, right? Nope. The framers of the Constitution feared the political power of a military establishment. They allowed the Congress to create an army if needed but put a constitutional limit on funding any such venture of two years, deliberately precluding the establishment of a permanent army. When General Arthur St. Clair and his army of predominantly state-militia troops were defeated by American Indians at Wabash River in 1791, it became clear that such an arrangement was not going to work. A four-hour battle led to the deaths of 918 out of St. Clair’s force of 1400. St. Clair and some of his men escaped, leaving those left behind to be brutally scalped and killed. Among the slain were women and children who had been accompanying the force. Imagine losing nearly half of your troops in a single encounter! Even Congress could see a problem with that. A few months later it created the Legion of the United States, the precursor to the US Army. Major General Anthony “Mad Anthony” Wayne was appointed Commander-in-Chief and was given five thousand men. There have been many Mad Anthonys in the USA’s political history, but General Wayne has the distinction of being the first. Who decides what the Constitution means? Given that many of them were lawyers and that they were aware of the extensive interreligious wars that had arisen in Europe from different interpretations of the Bible, the founding fathers must have known that the new Constitution would engender controversies regarding its interpretation, yet they left the preferred method for resolving such disputes in doubt. Although the Tenth Amendment stated that any powers not given to the federal government by the Constitution were to be reserved for the states and the people, this did not clarify precisely what federal powers were to be inferred from the text, setting up a seemingly interminable tug-of-war between the federal government and the states over the scope of their respective powers. The Alien and Sedition Acts of 1798 imposed restrictions on immigration and press freedom. Congress had passed them to crack down on potential dissidents who might ally themselves with France against the United States in the event of war. James Madison and Thomas Jefferson recognized that the Acts violated individual liberties guaranteed by the Bill of Rights. They produced the Kentucky and Virginia Resolutions in response. Jefferson’s Kentucky Resolution argued that the states could nullify federal laws that they deemed to be unconstitutional; Madison’s Virginia Resolution simply declared the acts in question unconstitutional. The Resolutions fell largely on deaf ears and no other states endorsed them. Perhaps the fact that they were published anonymously was partly to blame. The controversy passed, relations with France improved, and in 1800 Thomas Jefferson became President, yet there was no resolution to the Resolutions. Today, questions regarding constitutional interpretation are ultimately resolved by the Supreme Court, but back in 1798 the role of the Court in this regard was not clear. Under the Constitution, the Court had been given ultimate “judicial power” but the principle of judicial review was not firmly established until the Marbury v. Madison case of 1803. Judicial power gave the Court authority over the entire judicial system but judicial review extended the Court’s power by enabling it to rule on the constitutionality of actions taken by the legislative and executive branches too. In Marbury v. Madison, the Court affirmed its right to override a provision of Congress’s Judiciary Act of 1789, ironically on the grounds that the Act extended the Court’s own powers beyond what the Constitution prescribed. Try to get your head around that one! Although the Constitution authorized Congress to create coinage, it did not provide any details as to what sort of currency the nation should have and it made no mention at all of paper money. The latter was a controversial subject because paper money had been issued by the Continental Congress during the Revolutionary War and had quickly lost almost all of its value. The US Mint was set up under the 1792 Coinage Act. The Act also established the gold eagle as the official US currency. Each eagle was to be made up of ten smaller units made of silver and called dollars. These smaller units were modeled on Spanish dollars, which were already in circulation throughout the states. In 1933, the eagles were withdrawn from circulation and only the all-conquering dollar remained. The young United States had trouble keeping its money. The newly minted American coins were based upon a valuation that assessed gold at fifteen times the value of silver. Since gold was actually worth more than that, speculators could make money by trading silver for American gold at the undervalued 15 to 1 rate, so the golden eagles tended to fly out of the country. The US silver coins also tended to leave, but for a very different reason: although they contained less silver than their foreign equivalents, they were prettier because they were freshly minted and people therefore preferred them anyway. “If only there were some form of currency that was neither intrinsically valuable nor aesthetically pleasing,” thought our wise forebears, “Can we just make it out of paper?” National paper currency was introduced during the Civil War. The Constitution makes no mention of political parties. In fact, the founding fathers were very concerned about the kind of division that such parties might create. However, factions of like-minded people developed even before the Constitution was signed and these soon developed into two distinct parties, the Federalists and the Anti-Federalists. In his 1796 farewell address, Washington stated that parties were “Likely in the course of time and things, to become potent engines, by which cunning, ambitious, and unprincipled men will be enabled to subvert the power of the people and to usurp for themselves the reins of government, destroying afterwards the very engines which have lifted them to unjust dominion.” You don’t say? The failure to allow for party divisions is demonstrated in the unworkable method that the founding fathers established to select a vice president: he was simply to be the runner up in the vote for president. This meant that the vice president could easily be someone from a different party from the president’s, with a different philosophy and agenda. Had the original system still been in place in 2016, Hillary Clinton could have ended up as Donald Trump’s VP. Not easy for either of them. It was the passing of the 12th Amendment in 1804 that separated the Electoral College’s vote for president from its vote for vice president. What really got these parties started in America was the “second party system” that emerged after Andrew Jackson became president in 1828. Jackson’s party was the Democratic Party; his opponents formed the Whig Party, which emphasized the power of the Congress in opposition to the presidency. One significant aspect of party politics in this era was that both parties were competitive in all regions of the country, making it a truly national two-party system, although other parties also existed. Eventually, the Whig Party, which became divided over the issue of slavery, collapsed and after 1854 was largely replaced by the newly founded anti-slavery Republican Party. Before signing a contract we usually check under what circumstances it can be terminated or revoked. We do not normally want to get into anything that we cannot get out of. I suspect that most of the folks who wrote and ratified the Constitution would have assumed that the sovereign states that they represented could quit the agreement if it didn’t work out. The Constitution, however, did not spell out any mechanism through which states could secede. Many arguments were later made pro and con as to whether secession was allowable. Some asserted that the right to secession followed from the fact that the Union was from the onset a voluntary association, others that the right was implied under the Tenth Amendment, which reserves to the states any powers not granted to the federal government under the Constitution. Conversely, Lincoln claimed that a contract’s being voluntary did not mean that it was not binding on its members, and Madison stated in an 1832 letter that secession was essentially undemocratic because the seceding state was a minority asserting its will against the wishes of the majority. It was not until after the Civil War that the Supreme Court partially resolved the secession question. In the 1868 case, Texas versus White, the Court ruled that secession is not a constitutional right but it left open the possibility of secession with the consent of the other states. What would happen today if a state did decide to secede? Would the question be decided by the Supreme Court, or would events simply unfold, leaving the Court to endorse the end result retroactively? What should the president do if an enemy launches an all-out nuclear attack on the United States? Presumably, he should counter-attack immediately. According to the Constitution the right to declare war is reserved for Congress, but in the event of a nuclear attack, the president would not be able to wait on Congress. The Constitution provides no clear authority for dealing with immediate security threats. Taken at face value, it severely limits the power of the president under such circumstances. In 1947, under the Truman Doctrine, it became the announced policy of the United States to “to support free peoples who are resisting attempted subjugation by armed minorities or by outside pressures”. This was an aspect of the global Cold War against communism, which, like a nuclear attack, could scarcely have been imagined by the founding fathers. The constitutionality of Truman’s Doctrine came under attack three years later when he committed troops to Korea without a Congressional declaration of war. This was destined to become one of a long series of incidents in Vietnam, Granada, Panama, Somalia, Libya and elsewhere where post-War presidents committed troops without Congressional approval. Suppose the president wants to launch an operation in secret in order not to forewarn an enemy? Imagine if there had been a plan discovered to launch missiles from Cuba towards the United States and Kennedy had needed to make a preemptive strike: if he had waited on a declaration of war from Congress, missiles might have been launched in the meantime. The Constitution would not be much use if the nation itself were destroyed. What if the United States is not even the target of an expected attack? We are truly on shaky ground constitutionally when a president launches a military action in order to protect foreign civilians, such as when President Obama acted to prevent likely massacres in Benghazi and on Iraq’s Mount Sinjar. In 1973, over the veto of President Nixon, Congress passed the War Powers Act to reassert its constitutional authority to declare war. As a result, subsequent presidents have tended to keep Congress more in the loop regarding military actions, but this has made little difference to the overall picture. We still don’t have an agreed upon solution to this problem and probably won’t get one any time soon. The right to vote was not guaranteed in the Constitution or the Bill of Rights, not even for white males, and not even for white males who owned property, unless their property’s value exceeded the threshold set by their state. In order to find a positive right to vote in the Constitution, the meaning of the word Constitution has to be extended to include much later amendments. In 1856, North Carolina became the last state to remove property requirements, but Pennsylvania and Rhode Island still required that voters be taxpayers, even into the twentieth century. After the Civil War, the Fourteenth Amendment (1868) extended voting privileges to African Americans and other minorities, but not to women. One might assume that, as citizens, women could logically assert their right to vote. However, this argument didn’t work for Virginia Minor of Missouri when she sought the right to vote. The Supreme Court did agree that she was a citizen but it insisted unanimously that the right to vote was not a “necessary privilege” of citizenship. That was 1874. Women had to wait until 1920 for their voting rights to be guaranteed under the 19th Amendment. The lands between the thirteen original states and the Mississippi River were ceded to the United States by Great Britain under the 1783 Treaty of Paris, which formally ended the Revolutionary war. At the time of the Constitutional Convention, there was no reason to suppose that the new nation would ever extend west of the river because that area had been claimed by Spain. In 1800, the eastern part of this territory was ceded secretly to France. For the founding fathers the notion that the new nation would expand westward all the way to the Pacific coast was not a realistic proposition and therefore they could have seen no reason to address the issues that would arise later when it became a reality. When discussing the future of the native American tribes there was no apparent need for the Constitution to address the future of numerous peoples who inhabited the western plains, the southern deserts, or anywhere else west of the river. The framers of the Constitution could not have seen the need to address the “big picture” regarding either the lands beyond the Mississippi themselves, nor the native Americans who inhabited them, nor the possibility of the expansion of slavery there. While the Constitutional Convention was still ongoing, the Congress of the Confederation passed the Northwest Ordinance of 1787, which clarified the process through which new states were to be admitted to the Union but it was assumed that this was to be applied to lands east of the Mississippi. Article 1, Section 8 of the Constitution implied that the native American tribes were separate entities from the states and that the authority to negotiate with them would reside with Congress. The Constitution did not consider native Americans to be citizens of the United States unless they were taxpayers, arguably implying that they must be citizens of their own sovereign states. A 1790 law forbade individuals or states from buying native American land. This protected the native Americans from unscrupulous people but it also took away their right to dispose of their own land in accordance with their own best judgment. Thus, the Court contradicted its own assertion that native Americans had a natural right to their own land. In 1871, the Indian Appropriations Act asserted that native American tribes were not to be recognized as independent nations except to the extent that this was necessary in order to avoid breaking already existing treaties. Regardless of intention, the Constitution failed to adequately safeguard native American rights. Yet the Declaration is not the Constitution. The Constitution itself allows a US president to make treaties only with the agreement of two thirds of the Senate. Constitutionally, the president is also obliged to seek the advice of the Senate regarding any treaty. This aspect was tested early on, during Washington’s administration when Jay’s Treaty was negotiated with Great Britain without Senate input. Eventually, the Senate approved the treaty retroactively. Over a century later, President Wilson similarly negotiated the Treaty of Versailles without consultation with the Senate. The Versailles treaty was voted down 55 to 39 in the Senate and was never ratified by the United States. The Constitution does not tell us who has the authority to terminate a treaty, so that has been another point of contention. Theoretically, the Supreme Court could find a treaty to be in violation of the Constitution, but that has never happened so far. A way to avoid the Constitutional limitation on international treaties is to negotiate agreements instead. What is the difference between a treaty and an agreement? There’s the rub! Treaties and agreements are equally valid under international law but under US Constitutional law the use of the word “agreement” saves the president from needing Senate approval. In other words, it is only through brazen semantic sidestepping that many of the United States’ international obligations are made consistent with its own Constitution. The end result is that the United States has often agreed to be subject to international law in numerous areas, including defense, territory, economics, crime prevention, etc., without Senate approval. Whatever the metaphysical misgivings of its primary author might have been, the Declaration of Independence was explicitly religious in boldly asserting that all men are “endowed by their Creator with certain inalienable rights.” Even today, every single US state constitution makes some mention God or “the divine” and of those that use the latter construction none were among the thirteen original states. The US Constitution, in contrast, does not directly mention God at all. The absence of any mention of God in the Constitution was noted at the time and was somewhat controversial. Because the mix of religious communities varied from state to state the question of religion was also a states rights issue. Some of the delegates even advocated allowing individual states to establish particular religions and it was not until 1833 that all states had curtailed the practice of financing established churches with taxpayers’ money. Jefferson and Madison initially disagreed about the need for a Bill of Rights with Madison of the opinion that deliberately avoiding enumerating specific rights would prevent the federal government from falling into the trap of accidentally compromising some rights by neglecting to state them explicitly. However, the First Amendment guarantees each individual the freedom to choose and practice a religion. “The Evolution of Suffrage Institutions in the New World” Stanley L. Engerman, University of Rochester and NBER; Kenneth L. Sokoloff, University of California, Los Angeles and NBER (February 2005). Google Books.